Alex McCarthy inspired Leeds United to a 1-1 draw at Watford with a penalty save – and then admitted he was ready to extend his loan at Elland Road. McCarthy urged his parent club Reading to renew his deal with Leeds after rounding off a month-long stint with another telling performance at Vicarage Road. The 22-year-old goalkeeper set up a dramatic finish by turning Marvin Sordell’s 88th-minute penalty onto a post. The Hornets were leading 1-0 at the time and Leeds took advantage when Robert Snodgrass netted a penalty to claim a point with the last kick of the match. United manager Simon Grayson wants to keep McCarthy and planned to discuss the player’s future with Royals boss Brian McDermott this week, though any extension may not kick in until after the sides meet at Elland Road in five days’ time. But reports yesterday claimed Reading intend to recall McCarthy permanently with plans afoot to sell their current first choice, Adam Federici. 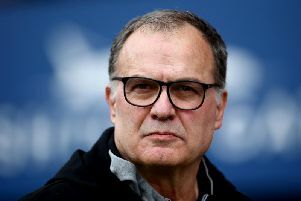 Leeds have two other senior keepers – Andy Lonergan and Maik Taylor – but McCarthy’s form during six Championship appearances has impressed Grayson. Asked if wanted to remain with Leeds, McCarthy said: “Yes. I’ve enjoyed my time here and I’m playing. And he credited his penalty save in part to United goalkeeping coach Andy Beasley, saying: “Andy told me that Sordell had put his last two penalties to the keeper’s right.